When people ask marine biologist Angela Corvea why the symbol of her environmental project Acualina, which has transcended the borders of Cuba, is a little girl, she answers without hesitation: "Because life, care, attachment, the creative force of life lie are contained in the feminine world." At the mouth of the Aguán river on the Caribbean coast of Honduras, a Garífuna community living in a natural paradise that was devastated 15 years ago by Hurricane Mitch has set an example of adaptation to climate change. A month after Hurricanes Ingrid and Manuel caused the worst destruction from a natural catastrophe in Mexico in 30 years, another disaster has come to light: hunger in communities that are supposedly served by a rural food supply programme. The United States government is recommending new preparations aimed at protecting vulnerable communities from climate change-related disasters, a year after a major hurricane devastated swaths of the country’s East Coast. Rather than talk about forecasts for hurricanes at the start of this year’s season, Cuban meteorologist José Rubiera prefers to discuss the importance of reducing the country’s vulnerability and improving preparedness. Houses with sturdy masonry walls and reinforced concrete roofs, looking like they could survive any tropical storm or hurricane, are sprouting up on the outskirts of this city in central Cuba, thanks to the development of local production of construction materials. 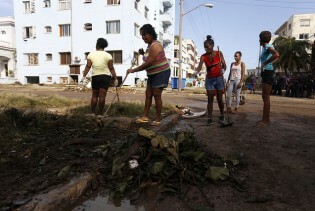 The new cyclone season in Cuba is forecast to be highly active, and it announced its arrival with intense rains that caused rivers to burst their banks and flooded extensive areas in the western province of Pinar del Río. Nicaragua, which is prone to natural disasters like hurricanes, earthquakes and flooding, is confronting them with prevention measures and community drills and training in high-risk areas. "Adaptation to climate change is urgent and must be part of development," said Bárbara Pesce-Monteiro, the United Nations resident coordinator in Cuba, assessing the damage done by hurricane Sandy in the eastern region of the country. You can still see broken plates, toys, books and some photographs among the rubble that was once the homes of Rey Antonio Acosta’s family and other families in Mar Verde, the beach community where Hurricane Sandy made landfall in this eastern Cuban city. I am aware that my arrival last week helped re-elect U.S. President Barack Obama. Superstorms like me don't play politics, but it should be clear by now that your refusal to tackle global warming has serious consequences. Higher sea levels and amped-up hurricanes like me are just two of them. As the Caribbean reaches the end of October – the second-to-last month of the Atlantic hurricane season – Sandy has caused significant material losses and claimed the lives of 44 people in Haiti, 11 in Cuba, two in the Dominican Republic, one in Jamaica and one in the Bahamas. The impact of Hurricane Isaac as it made its way through the Caribbean region highlighted both the fragility of some countries in the face of extreme meteorological events, which are expected to become more and more intense, and the different strategies adopted to mitigate the risk of disasters.